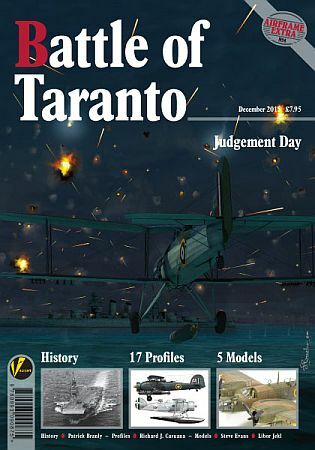 Valiant Wings Publishing finishes 2015 with the fourth title in the much-acclaimed Airframe Extra series: The Battle Of Taranto - Judgement Day. Many active scale modellers like to build subjects based on a theme or historical event. This series looks at specific areas and events in the history of aerial warfare. Each title covers the history and timelines, detail of the protagonists, period photographs and superb colour artwork from Richard J Caruana. Specific kit builds in all three major scales (1/72nd, 1/48th and 1/32nd) from Dani Zamarbide, Steve A. Evans and Libor Jekl commemorate each event that we cover. Each title is A4 in size, with gloss laminated covers and retails at £7.95 per copy. Available direct from Valiant Wings Publishing (www.valiant-wings.co.uk) or from all good specialist bookshops. Covers the events leading up to, during and after the Fleet Air Arm's assault on the Regia Marina.